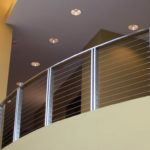 We work with a lot of contractors and designers, but many other business owners count on Foreman for top quality custom metal fabrication, too. 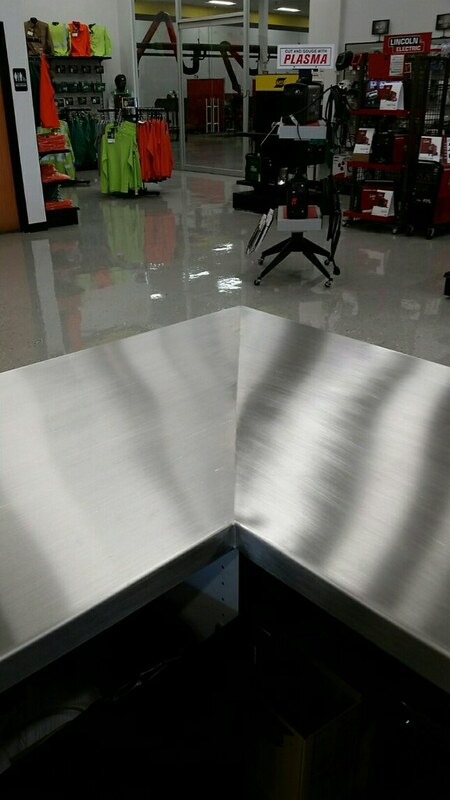 Foreman’s work in retail locations sets a level of quality and distinction that customers notice. 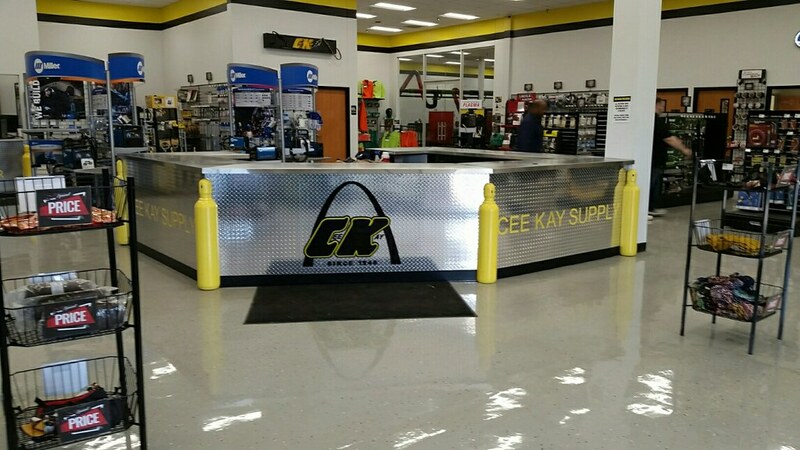 An example of a business showcasing our work is the Cee Kay Supply retail location on Manchester. Countertops can make or break the look and feel of a room. Because countertops are a focus in any room, it’s critical that they’re aesthetically pleasing. Cee Kay needed multiple counters in their store, so they came to Foreman for help. 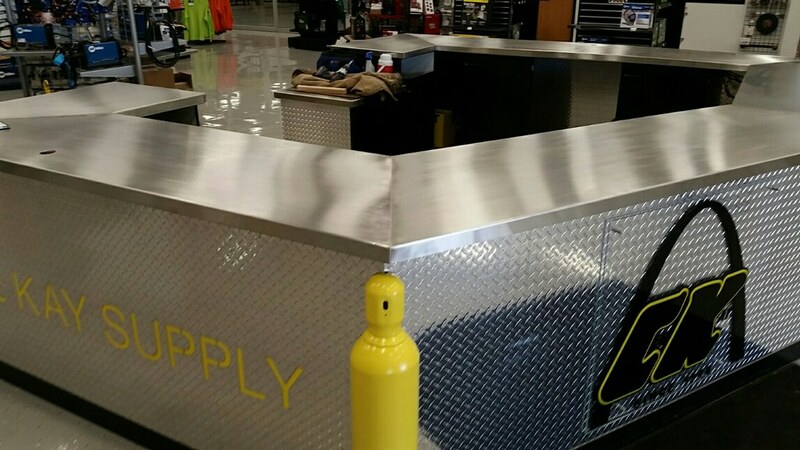 Foreman fabricated the stainless steel countertop, aluminum tread plate, yellow painted steel gas bottles, yellow aluminum backer panels, and black aluminum base trim beneath the counters in their store’s showroom. 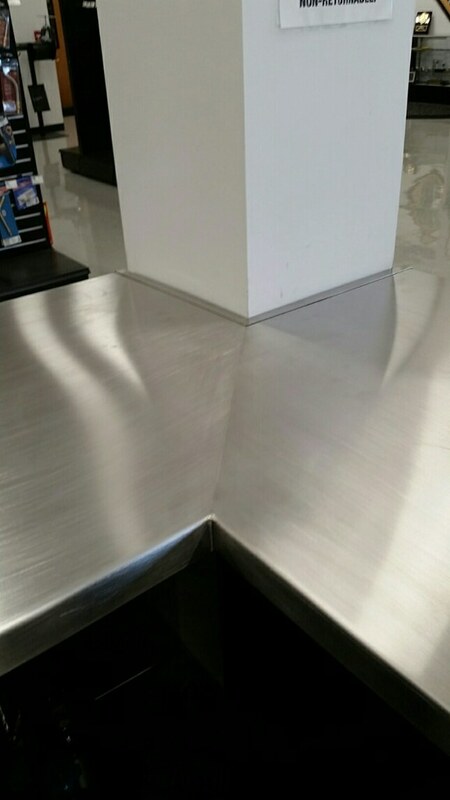 We also fabricated the stainless steel counters in the rental, repair and hospitality areas. 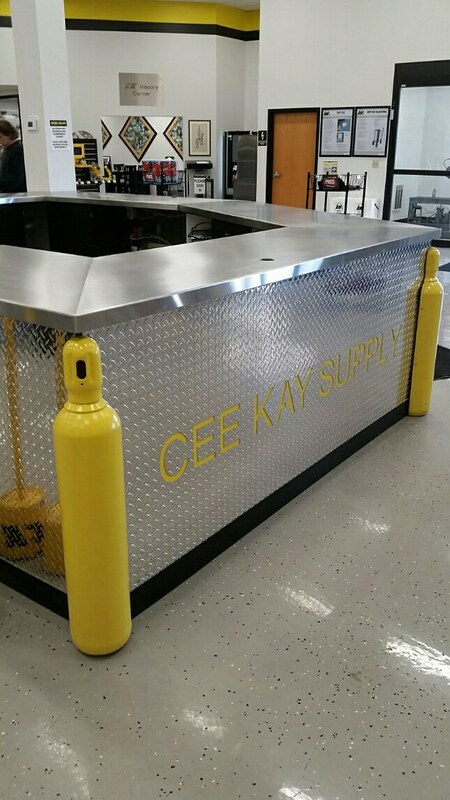 We used bright finish checker plate or diamond plate for the front-facing panels, and for a nice decorative element, gas bottles were cut to fit each corner of the counter. 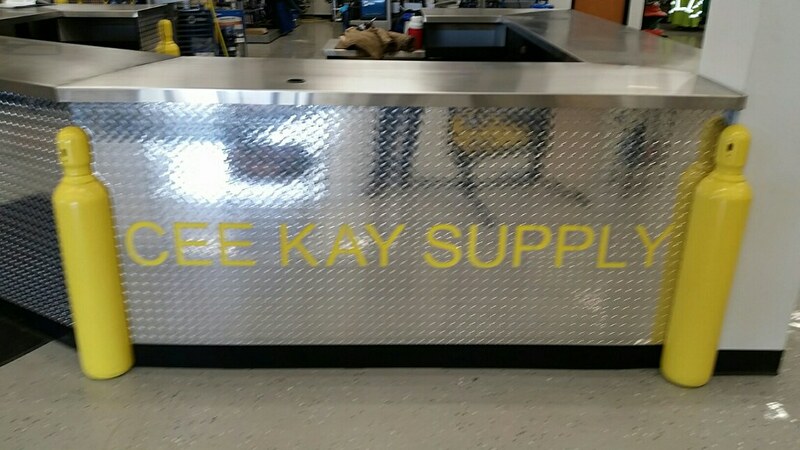 Finally, Cee Kay’s logo was applied to the front section. The “Cee Kay” letters were laser cut in the checkerplate, allowing the yellow material behind to peek through. The result is durable, and reinforces Cee Kay’s product line, image and branding. Custom made counters improve the image of your business, and they improve the customer experience by fitting better in your particular workspace. Given this example, take a minute to imagine what we could do for your business. Do you have a product or other element of your business that you’d like to incorporate into the design? 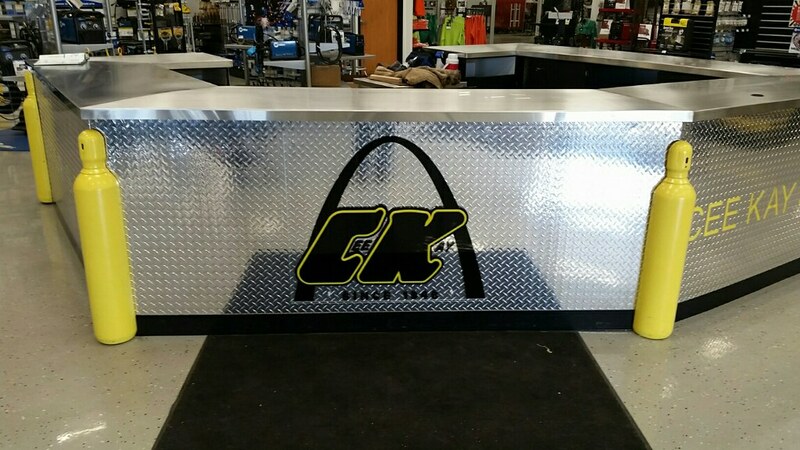 Would you like your logo cut into the front of the counter, or laser cut out of metal and attached to the front? Would you like to incorporate decorative lighting behind the logo, or under the overhang? Do you have an idea, but you’re not sure if it can be done? Call us. 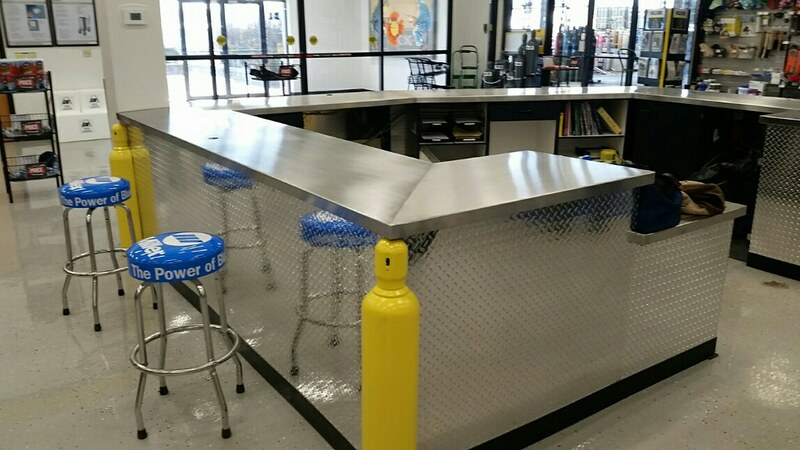 If you need bartops, countertops, stainless steel drink rails, bar well rails, a simple metal bracket or anything else fabricated from metal, Foreman Fabricators is the metal manufacturer to call. 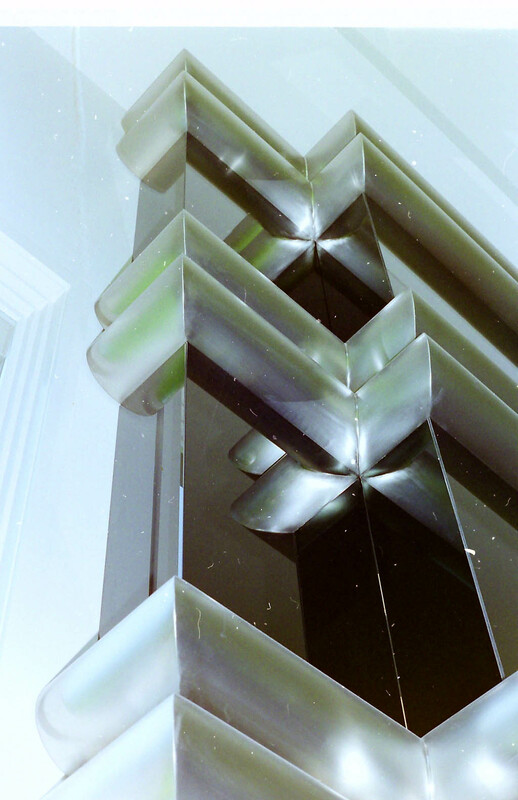 We offer a variety of finishes to give you the look you want and the durability you need. 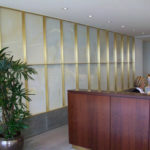 We also do modifications, upgrades and repairs to existing metal items, including counter and lobby areas. 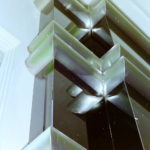 We can make a single, one-of-a-kind item or we can make thousands of them. Damaged or Worn Metal Equipment or Parts? 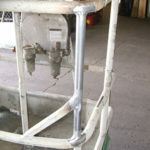 Repair It, Don’t Replace It, with Foreman Fabricators, Inc. 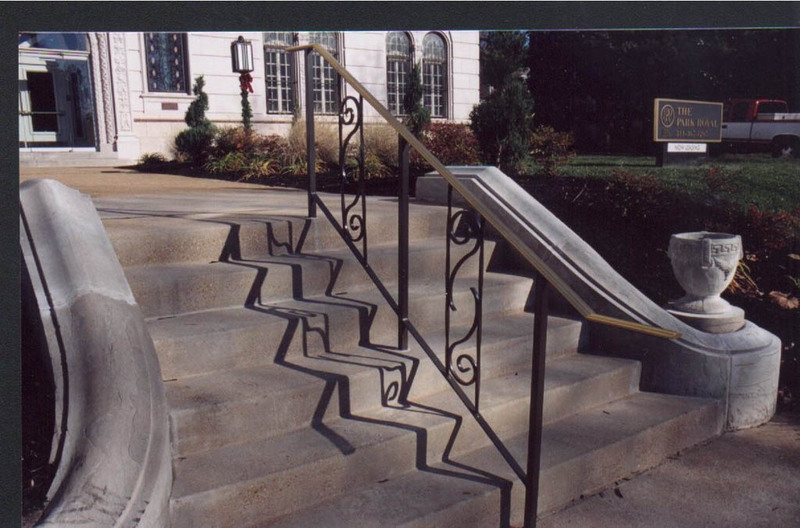 If it’s made of metal and you’re looking for solutions, Foreman Fabricators is the one to call first. Repair It, Don’t Replace It, with Foreman Fabricators, Inc. 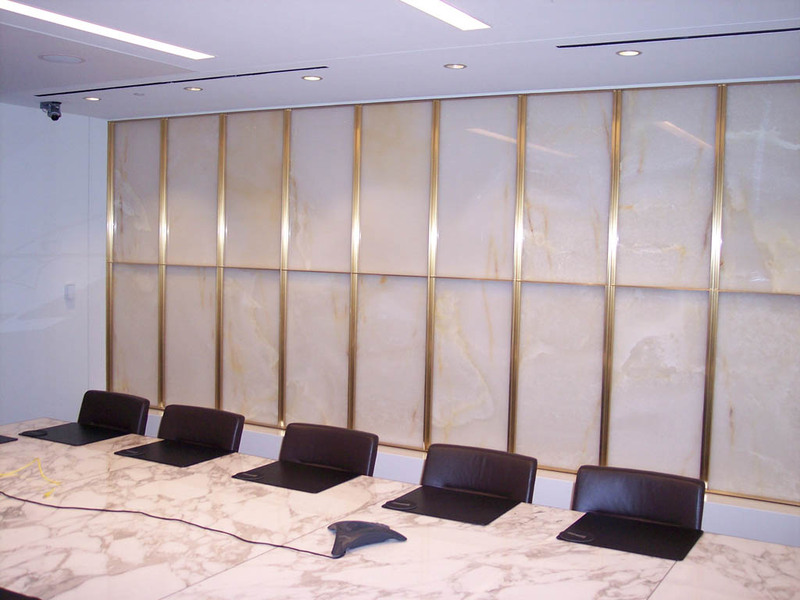 Since 1959, Foreman has been known as a top quality metal fabricator specializing in stainless steel, aluminum, brass, steel, bronze, copper and more. 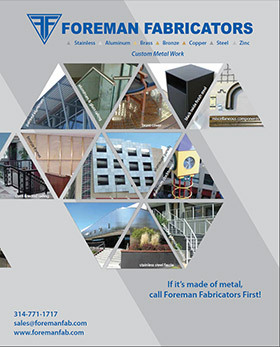 Construction companies, contractors, window glaziers, architects and designers know Foreman well for their expertise in manufacturing a variety of architectural metal items including handrails, staircases, entryway canopies, gratings and more, plus brake metal cladding for elevators, windows, pillars and walls…the list goes on and on. 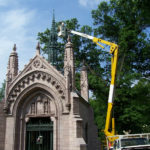 But many companies, building owners and even residential customers also know Foreman as the one to call for replacement and repair of a wide variety of metal items. 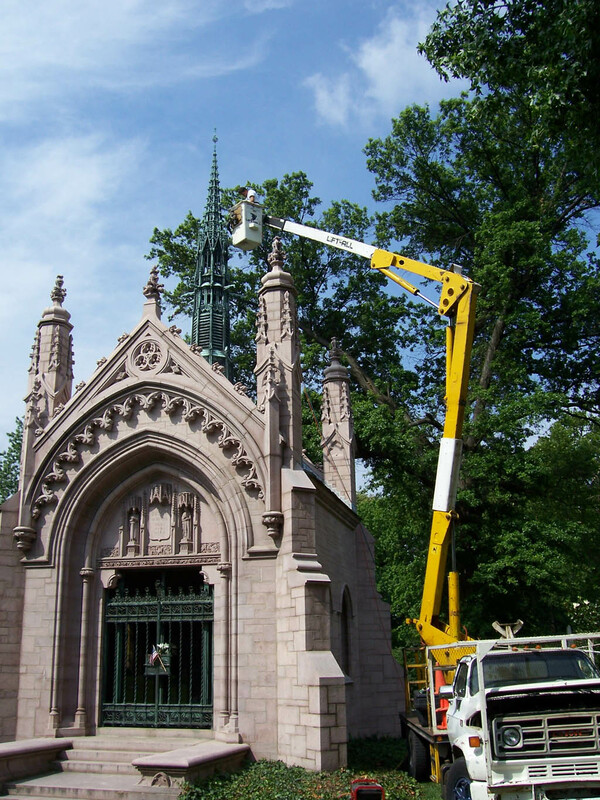 A perfect example of how Foreman can help is their work with a company called Spider (aka “Spider Staging”), who in 1946 pioneered the powered suspended access business. 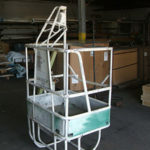 Spider is an industry leader in manufacturing and renting high rise window washing/painting hoists and platforms, work cages, scaffolding, rigging equipment and a variety of related items that make it safer for workers to access tough to reach areas of industrial and commercial building sites, whether it be for construction or maintenance. Naturally, their equipment has to stand up to stringent OSHA regulations for durability and safety, and due to the nature of the use of their equipment, it takes a beating on a regular basis. That’s where Foreman Fabricators comes in. Spider sells much of their equipment outright, but because their highly specialized equipment is costly and often only needed at a given site for relatively short periods, they also run a thriving rental business. Spider regularly sends damaged or worn equipment to Foreman for refurbishing and repair, which is a cost effective alternative to replacement of these expensive items. 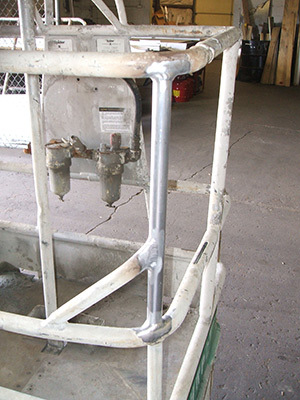 Sometimes it’s a broken weld or two, or a damaged section that needs repair or replacement, and sometimes an entire cage requires replacement. 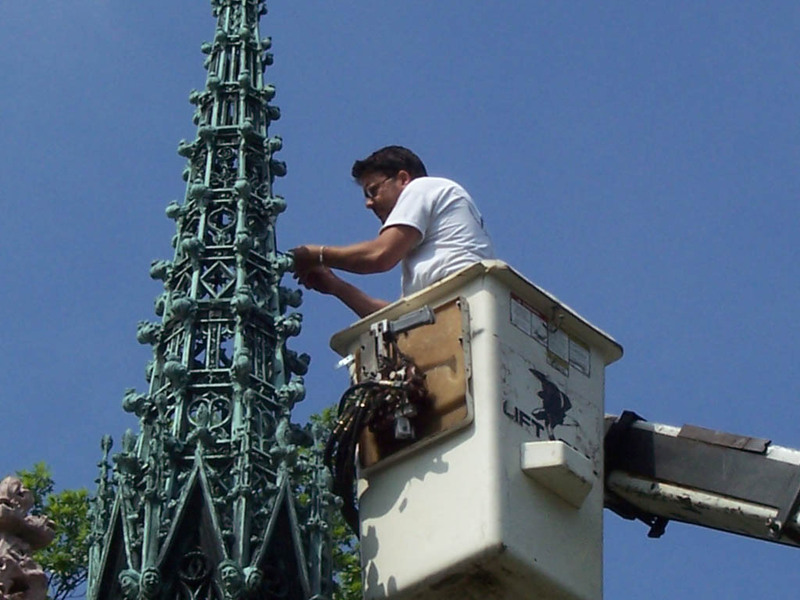 Foreman’s skilled craftsmen have the expertise to handle such repairs, and their welding technicians are certified on steel, aluminum and stainless steel, an important part of OSHA requirements for working on safety equipment such as that provided by Spider. 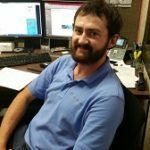 When an inspection of their equipment identifies any fault with their equipment, Spider knows that Foreman Fabricators has the expertise to do the job right and provide all the necessary documentation for their OSHA maintenance records. 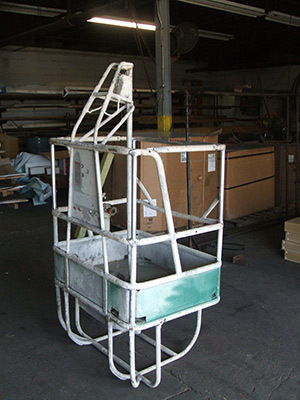 As they do for companies like Spider Staging, Foreman has the expertise to match existing metal parts that have become worn or damaged, which helps customers reduce costs by repairing or replacing expensive metal parts instead of buying something new. They can also create specialized, one-of-a-kind parts and components to meet the specific needs of a customer. 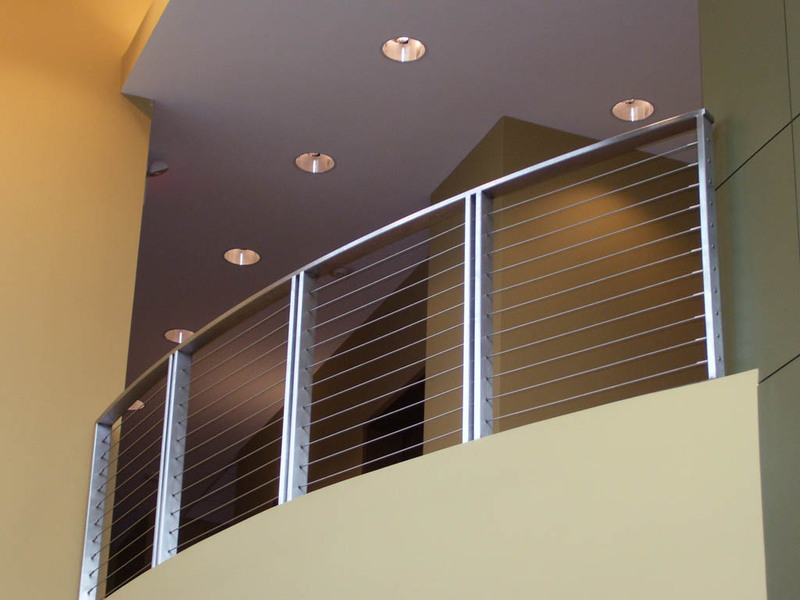 Foreman does a lot of work with facility owners and their maintenance departments to offer solutions such as customized door plates and corner guards, grate replacements, elevator cladding fixes or upgrades, railing and guardrail replacement and repair, and so on. They also work with a wide variety of companies to help them maintain expensive equipment that has metal parts prone to wear or damage. Foreman Fabricators does it all when it comes to the art of welding, polishing and buffing. If you simply need strong, durable welds that will stand up to heavy industrial use, we can deliver. And we’re experts at producing finely finished welds that “disappear” into the finished work AND FINAL “FIT-UP”, making a multi-pieced assembly look as though it were a single unit. From new fabrications designed to your exact specifications, to repairing a broken metal item of almost any kind, to matching an existing item for replacement, there’s no one better than Foreman Fabricators. Whether it’s for durable utility or for exceptional beauty, or both, Foreman Fabricators has the welding and polishing skills to meet your needs. Contact us today for a quote or specs on any of your welding or polishing needs. 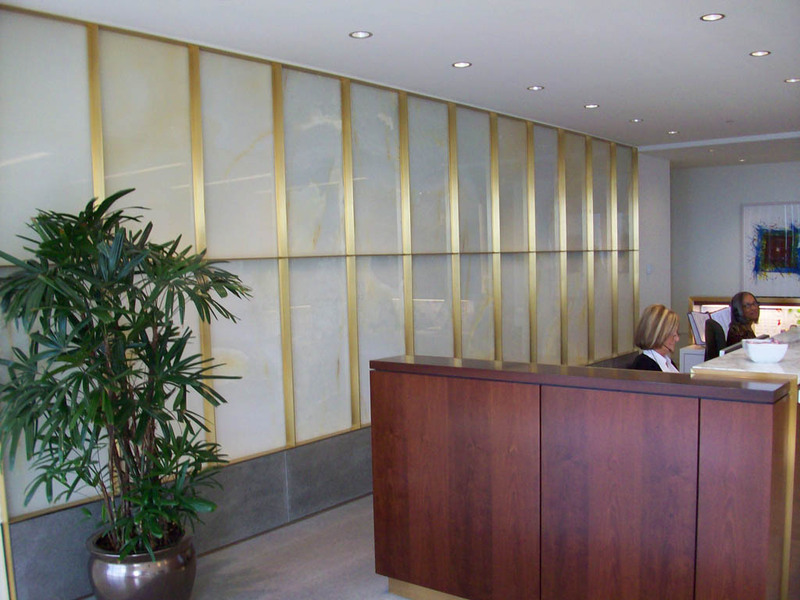 A variety of weld finishes are available based on the intended use of the fabricated item and the need for aesthetic appeal. A picture is worth a thousand words! 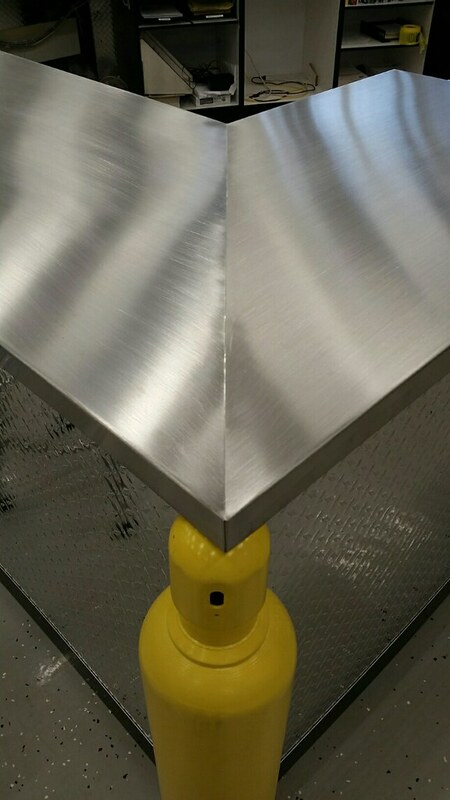 Foreman Fabricators has fabricated almost anything you can imagine, and there’s no better way to describe our capabilities than through pictures. We encourage you to peruse our product galleries to get a more complete understanding of our extensive capabilities. 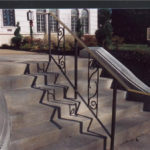 Foreman Fabricators prides itself on being able to handle real challenges in metal fabrication. When we were approached by a homeowner to create a unique spiral staircase for a residence, we knew we were up to the job. It seems another fabricator had started the job, encountered insurmountable problems with the complexity of the fabrication, and left the customer in the lurch.